Hundreds of seniors in red caps and gowns at their Florida high school graduation ceremony on June 3 listened intently to speakers who told them what they could achieve. "Don't let anything stop you," one said. But when student Joaquin Oliver's name was read out by the principal, it was his parents, Manuel Oliver and Patricia Padauy, who walked onto the stage to receive his diploma. (Carlos Garcia Rawlins/Reuters) Patricia Padauy, the mother of Joaquin Oliver, one of the victims of the mass shooting at Marjory Stoneman Douglas High School, holds up her son's diploma during his graduation ceremony in Sunrise, Florida, June 3, 2018. Joaquin, 17, was one of the 17 students and staff members killed at Marjory Stoneman Douglas High School in Parkland, Florida, on February 14, 2018. The massacre by a former student who stormed classrooms with an assault rifle has spurred unprecedented activism by victims' families to prevent future gun violence. "This Should Be My Son," read the words on the bright yellow T-shirt Patricia wore for the ceremony at an indoor arena in the nearby city of Sunrise. Since the mass shooting, Manuel Oliver, a 50-year-old artistic director, has traveled across the country, building murals in honor of his son. He calls the murals "Walls of Demand." 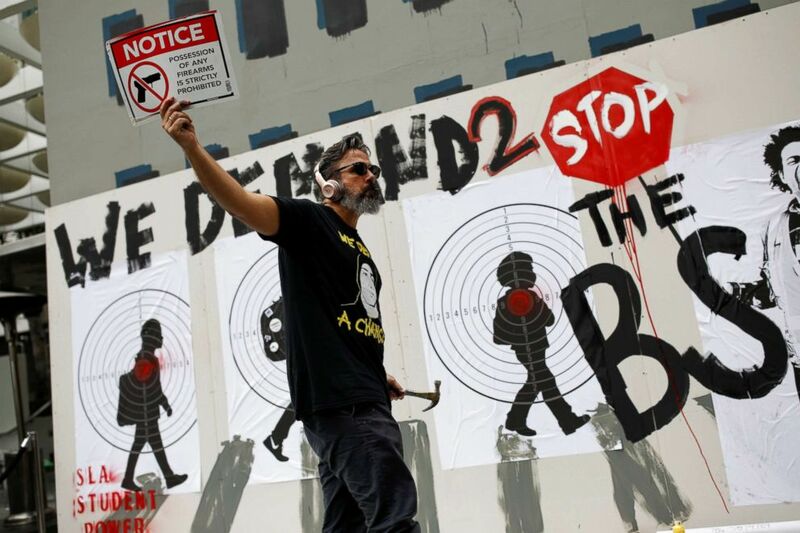 (Carlos Garcia Rawlins/Reuters) Manuel Oliver, father of Joaquin Oliver one of the victims of the mass shooting at Marjory Stoneman Douglas High School, holds up a placard as he paints a mural to commemorate the victims of the shooting and promote gun control in Los Angeles, California, April 7, 2018. As he paints the mural Oliver listens to his son's favourite music on the headphones that belonged to him. The mural depicts his son the day that he died, carrying flowers to his girlfriend for Valentine's day. In Los Angeles, he painted a mural with rifle targets set atop a silhouette of an image of Joaquin as he walked to school that day with a bouquet of sunflowers in his hand to give to his girlfriend. Once completed, he drove a hammer into the mural 17 times, one for each victim, and hung a sunflower in each hole. He says he enters a trance while painting as he connects with memories of his son: the motor-bike they built together in the family garage, for instance, and endless games of basketball. As he works, he listens with his son's headphones to the music they used to enjoy together, often the Ramones or Guns N' Roses. Manuel says the murals are more than a way to drain his anger and sorrow. "What the hell does it matter how I feel? This isn't about me, this is about my kid," he said in an interview in Florida, a few days after he painted the Los Angeles mural. 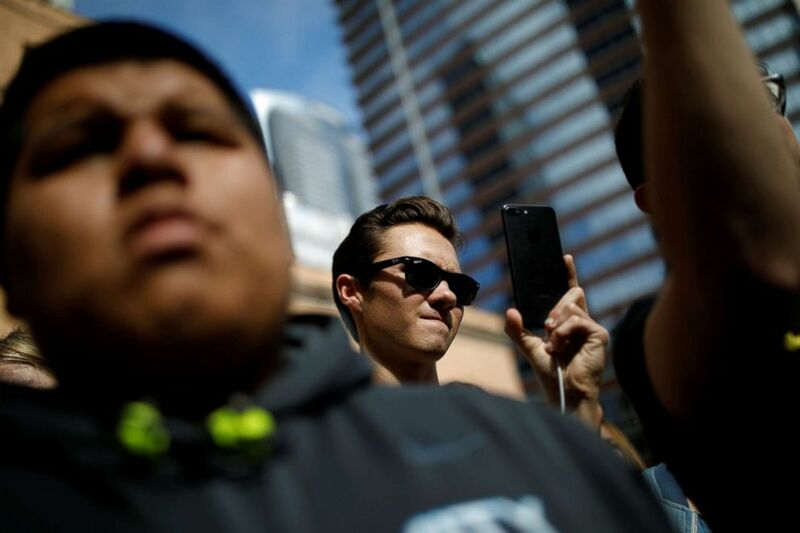 (Carlos Garcia Rawlins/Reuters) David Hogg, a student and shooting survivor from Marjory Stoneman Douglas High School uses his cellphone as Manuel Oliver, the father of Joaquin Oliver one of the victims of the mass shooting, paints a mural to commemorate the victims and promote gun control in Los Angeles, California, April 7, 2018. "Joaquin's picture is a protest. Joaquin is a martyr, killed by a murderer who was endorsed by [a] system that allows these things to happen." Manuel and Patricia now dedicate their time to an organization that seeks to empower youth leaders called Change The Ref (CTR), a name inspired by a conversation with Joaquin about the referee of one of his basketball games. 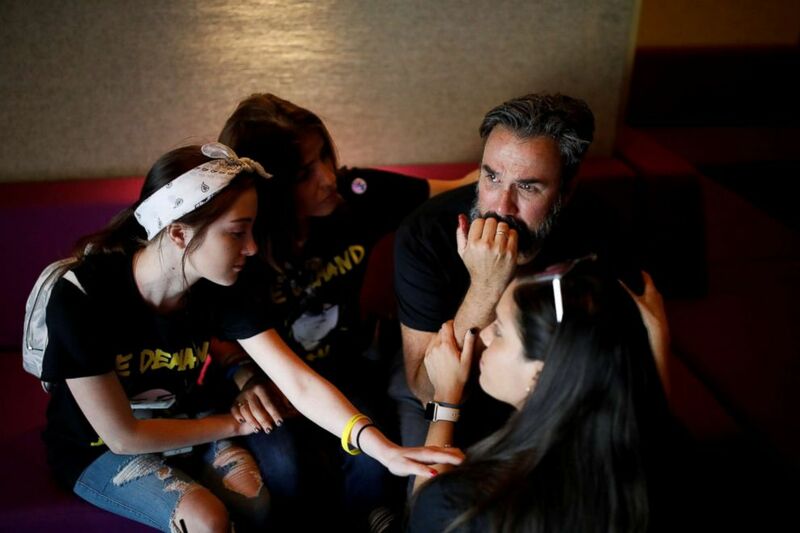 (Reuters) Manuel Oliver, the father of Joaquin Oliver one of the victims of the mass shooting at Marjory Stoneman Douglas High School, cries next to his family after painting a mural to commemorate the victims of the shooting and promote gun control in Los Angeles, California, April 7, 2018. The group aims to use art and "nonviolent creative confrontation" to keep people talking about the victims and pressuring lawmakers to pass stricter gun regulations. "You took something horrific, and instead of letting it stop you, you started a movement," the comedian Jimmy Fallon told students and victims' families in the commencement address at the June 3 graduation ceremony. Carlos Rodriguez, a 17-year-old Stoneman Douglas student who witnessed the shooting, launched a social media project called Stories Untold to collate footage of the incident. It has evolved into a broader effort to encourage victims of gun violence around the country to share their stories. 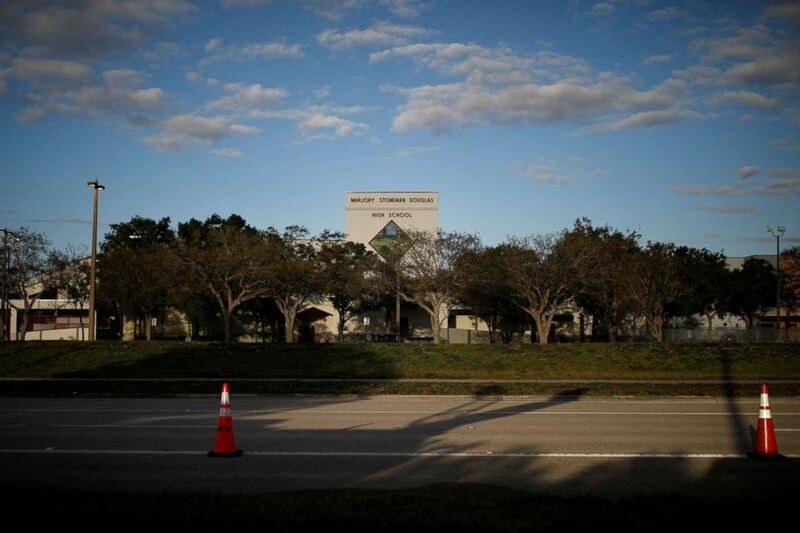 (Carlos Garcia Rawlins/Reuters) The entrance to Marjory Stoneman Douglas High School is seen after the police security perimeter was removed, following a mass shooting in Parkland, Florida, Feb. 18, 2018. He says the reaction to Parkland was notably different from previous mass shootings, in part because it affected a group of teenagers well-versed in using social media. The Parkland attack "affected high school kids, millennials, Generation Z-ers -- we practically have a roadmap of what we need to do." He was infuriated by the May 18 shooting at Santa Fe High School outside Houston, Texas, which killed 10 people. (Carlos Garcia Rawlins/Reuters) Daniela Menescal, right, who was injured by shrapnel during the mass shooting at Marjory Stoneman Douglas High School, attends a baseball game her brother is playing in, in Parkland, Florida, April 5, 2018. "It was like we were reliving what happened at our school. I wanted to be there with those students." Parkland, a once quiet Florida suburb, is now filled with memorials and posters alongside its streets, parks and shops, demanding stricter gun control. Almost 70 percent of American adults support strong or moderate restrictions for firearms, a Reuters/Ipsos poll in May found. President Donald Trump has vowed not to tighten firearms laws despite multiple mass shootings this year and instead called for arming teachers and increasing school security. (Carlos Garcia Rawlins/Reuters) Daniela Menescal, who was injured by shrapnel during the mass shooting at Marjory Stoneman Douglas High School, helps her brother practice baseball at their house in Parkland, Florida, April 4, 2018. Daniela Menescal, 17, was hit by shrapnel during the Parkland attack and saw several classmates killed. Now recovered from her injuries, she puts her energy into spending time with family and focuses on studying piano and playing tennis to avoid thinking about that day. "We've become a more united community after everything that happened," said Menescal. "With the leadership of my classmates, we can raise our voices so that people understand that these changes need to happen." 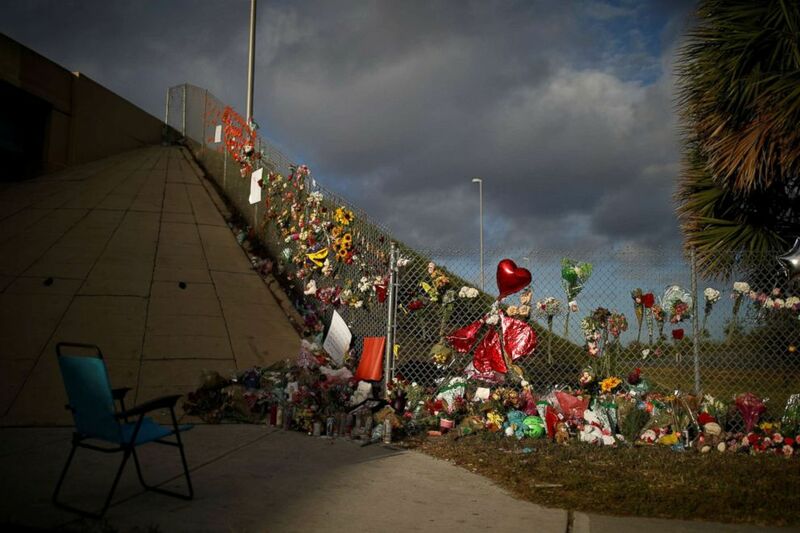 (Carlos Garcia Rawlins/Reuters) An empty chair is seen in front of flowers and mementos placed on a fence to commemorate the victims of the mass shooting at Marjory Stoneman Douglas High School, in Parkland, Florida, Feb. 20, 2018.